This informal dinner with a small group of friends was a great way to finish off a week in London. We met at Berners Tavern, which is on the ground floor of the Edition Hotel in Fitzrovia. The dramatic high ceilings, striking décor and buzz in the room immediately put everyone in a festive mood. Chef Jason Atherton presents what he calls contemporary British cuisine. I only sample a few items on the large menu, but my dishes certainly deliver on that claim. 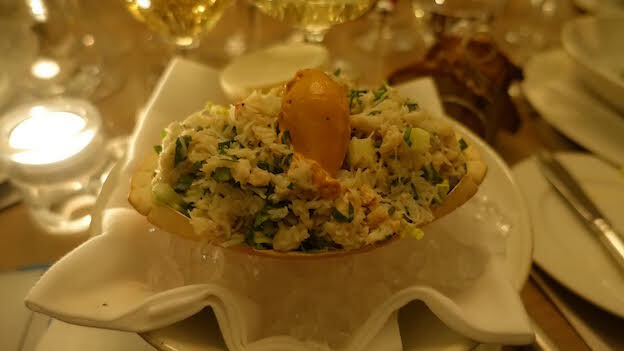 The Colchester crab appetizer is both tasty and absolutely perfect with our two white Burgundies. 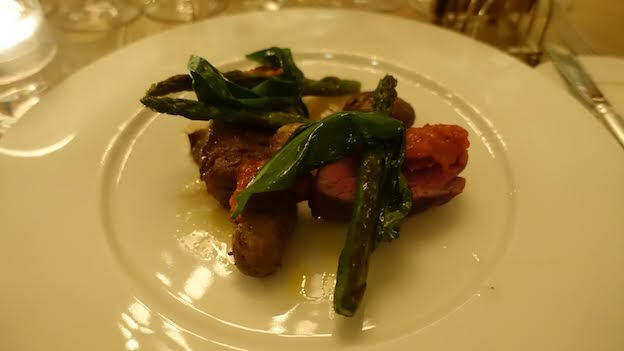 Another standout, the lamb main course is perfectly cooked yet also mild and not at all overpowering for our mostly delicate reds. I admit, I had more than one order of the triple cooked chips. After all, there was a lot of wine on the table, and one does have to eat. The selection of cheeses from the British Isles is an appropriate way to end a fabulous dinner. As for the wines, we do pretty well. All of the wines come from our own cellars. The 1962 Moët & Chandon Grand Vintage Collection, disgorged in 2012 and served from magnum, is brilliant. Warm, spiced and nutty notes give the 1962 much of its vinous, inviting creaminess and ample texture. Beautifully mature and wearing the graceful patina of age, the 1962 is absolutely gorgeous. The 1962 is (understandably) a bit more advanced than the 1976 I tasted the night before and the 1952 that would follow later in the evening, but it still is a great way to kick things off. Nineteen eighty is a vintage I like quite a bit in Burgundy, but this is my first time tasting Jean-Marie Roumier’s Ruchottes-Chambertin. Crushed autumn leaves, gently dried red berries and exotic spices give the Ruchottes its distinctive perfume and sweetness, but there is also lovely body and more than enough depth to support another 5-10 years of fine drinking. This is a very pretty wine made just before Christophe Roumier joined his father at the family domaine in Chambolle. The 1978 Domaine de la Romanée-Conti La Tâche is a bit light in color at the outset, yet it boasts captivating aromatics, silky fruit and a burst of richness allied with a tannic bite that kicks in on the finish. Hints of orange peel, rosewater and spices give the 1978 much of its exotic personality. This is not the best bottle of the 1978 I have had, but it is still quite pleasurable. The 1971 Grands-Échézeaux is surprisingly rich, with a real sense of density and gravitas in its dark flavors. Enveloping and bold, especially for a wine of its age, the 1971 is a real treat to drink today. Coche-Dury’s 2009 Corton-Charlemagne is tremendous. The classic Coche reductive bouquet is tempered by the wine’s textural richness and overall resonance. Layered, expressive and inviting, the 2009 is simply magnificent. I don’t know what else to say. The 2010 Montrachet from Domaine de la Romanée-Conti is surprisingly blowsy today, with huge fruit that nearly overpowers the intense, saline-driven notes that are such a signature. I have not tasted the 2010 in a few months, so it’s hard to say if the wine is going through a phase, or if the 2010 has begun to open up. Although quite a bit brighter and more citrus-inflected in style than other recent exuberant vintages (2008 comes to mind), the 2010 is quite big and forceful today. A flight of early Brunellos from Gianfranco Soldera follows. These are the three first Brunellos made from Soldera’s Intistieti vineyard. The 1979 Brunello di Montalcino is simply extraordinary. Soaring, intense and fabulously bright, the 1979 is endowed with superb depth and striking inner sweetness. One of my all-time favorites, the 1979 Soldera does not disappoint. What a wine! The 1978 Brunello di Montalcino exudes a level of depth, power and concentration that is rare for a wine of its age, although the aromatics aren’t as focused or pure as I had hoped. Sadly, the 1977 Brunello di Montalcino is fully oxidized, a victim of a cork not suitable for a wine of this pedigree. The 1952 Moët & Chandon Grand Vintage Collection is a fabulous intermezzo. How can a wine of this age, even if disgorged in 2013, be so fresh? Showing none of the nuttier notes of the 1962, the 1952 presents the classic slightly reductive, lemony Moët profile. The mousse is remarkably delicate. At nearly 64 years old, the 1952 is simply a miracle in a bottle. I hope to have an opportunity to taste it again someday. Our two 1990 red Burgundies are delicious, but they both also clearly show the ripe, flashy personality of the year. The 1990 Domaine de la Romanée-Conti Grands-Échézeaux is dark, fleshy and open-knit, but also a bit heavy and lacking in freshness. These wines have a way of aging for decades, and that will likely be the case here. Still, my impression based on this bottle and another bottle recently tasted at the domaine is that upside is limited. Rousseau’s 1990 Chambertin needs a good hour in the glass for hints of reduction to blow off. When they do, the 1990 is fresh, nuanced and wonderfully intense. At the same time, the 1990 is also surprisingly young. The richness of the vintage is evident, yet the 1990 is a wine to hang on to, as it is still at least a few years away from being at its very best. The 1975 Château d’Yquem brings the evening to a rousing close. A Sauternes of focus, aromatic intensity and precision – all especially remarkable given its age – the 1975 hits all the right notes. Subtle orange peel, spice, rosewater and vanilla are all beautifully delineated, but it is the wine’s overall balance that is most captivating. I can’t think of a better way to finish a fabulous night of wine, food and friendship.